A little visit to Liverpool yesterday gave me the opportunity to poke my nose in at Central again, to see what's happening with the works there. Things have certainly moved on, and it looks like they're approaching completion. In fact, there's only a few weeks before it gets finished. 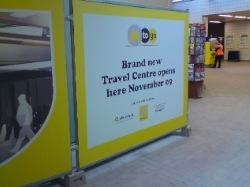 It's pleasing to note that the hoardings are listing a Travel Centre and an M to Go are being built. 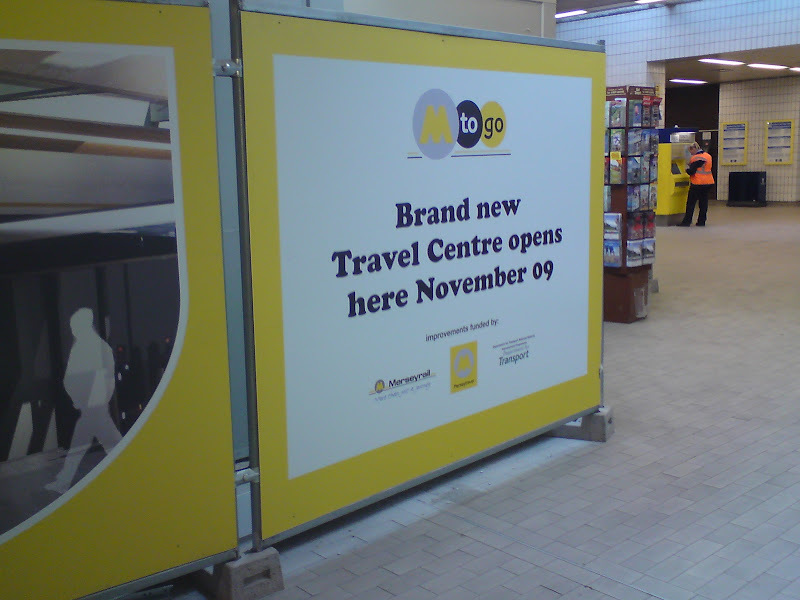 The Travel Centres at the Queen Square and Liverpool 1 bus stations are very good examples of passenger information facilities, and it would be good to see this carried over to the Merseyrail stations for a change. 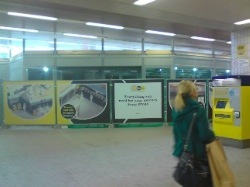 The building's nearly completed and it looks good, slotted into the ticket hall. Grey and yellow are fully in evidence of course. It's also good to notice that the plans incorporate three ticket machines, which should cut down on the queues. I was at Central waiting for a friend, and it gave me a chance to see just how busy the station gets. Even on a Tuesday lunchtime, there were loads of passengers streaming through in both directions. Annoyingly, very few people were using the ticket gates. Even the ones with paper tickets were wafting them in the direction of the inspectors. That never fails to wind me up. I was a bit bored of waiting, so I wandered down the passageway to Lewis' department store. It's pretty impressive that they managed to get this direct link to their store built into the booking hall - even Selfridges couldn't get London Underground to do that at Bond Street. I'd never been down the link before, and I was disappointed at how tawdry it was. I know Lewis' has gone through a lot of problems over the years, but still; this valuable pedestrian link leads into the back end of the bedding department, through ugly fire doors, and it feels like you've ended up in the store's abandoned bowels. I half expected Autons to lurch out of the walls at me. On the plus side, there are advanced plans for the whole Lewis' building to be refurbished into a new development, similar to the Printworks in Manchester, and I should imagine the direct link will be extremely valuable. 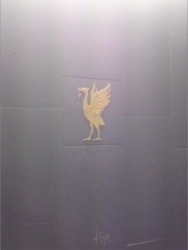 The saving grace was the blue painted passageway itself, which incorporated a nice gold relief image of the Liver Bird. 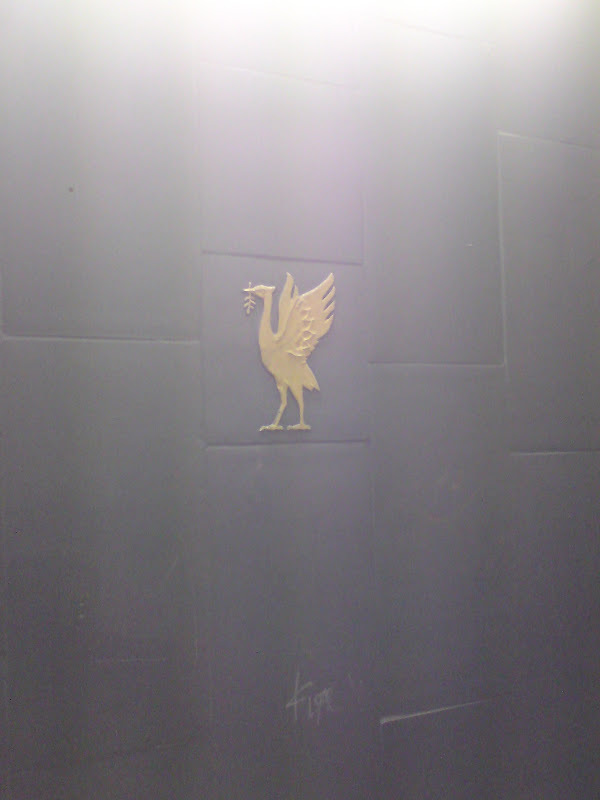 There's probably an interesting blog to be written, finding all the hidden Liver Birds throughout the city centre; there must be hundreds tucked away all over the place. Someone else'll have to write that one though. I've got my hands full already. You should have let me know you were about we could have grabbed a drink. Ah sorry - I didn't go into town till the afternoon and was home by half four..
Only one ticket vending machine - the hoardings are misleading! Enjoying your blog - especially as I pass a fair few of the stations on your mission when I make the journey from St Michaels to Southport and only ever see the platforms. Best of luck with the rest of it! That's not misleading - that's an out and out lie! I've half a mind to report them to the Advertising Standards people. 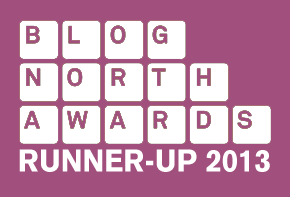 And Jame, thanks a lot - I've been enjoying the Boom-Bang-A-Blog ever since I discovered it a couple of weeks ago too!